Haryana SSC Group D Question Paper PDF 2018 : HSSC Exam Question Paper PDF, HSSC Paper 17th & 18th Nov Pdf, aryana Group D Paper PDF, HSSC Group D Exam Analysis, HSSC Group D Answer key, HSSC Question paper 17th – 18th November 2018. 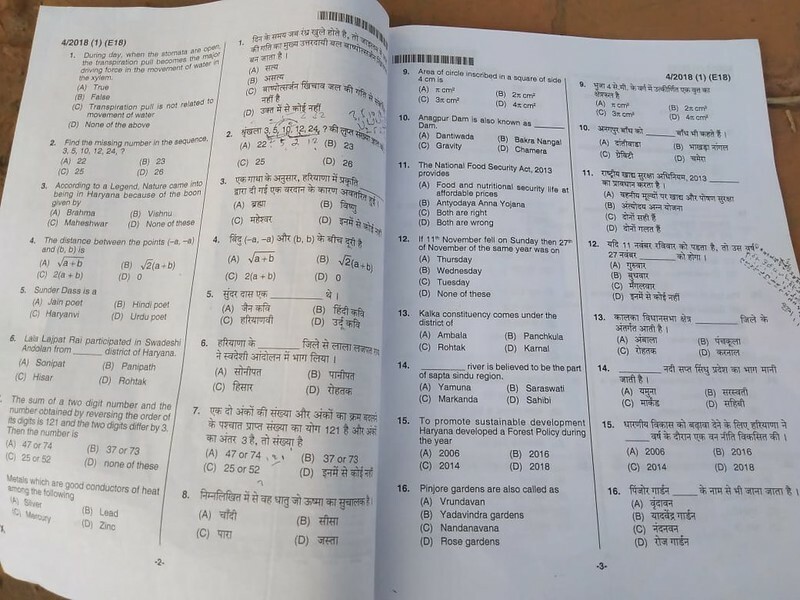 HSSC Question Paper PDF for Slot 1, Slot 2. Hello aspirants as we know that today Haryana Staff Selection Commission (HSSC) organised its Group D exam. So candidates must be looking for the HSSC Question Paper PDF with Solution. So below we are providing all the question paper PDF for the exam that held on 17th & 18th November 2018 (All SETS). We will update the HSSC Group D Question Paper of 17th & 18th November after the exam will be over. Please bookmark this page to get complete HSSC Paper Pdf on time. 1 9:00 A.M. 10:30 A.M. 12:00 P.M.
2 01:30 P.M. 03:00 P.M. 04:30 P.M.